Discover Boston’s famous sites and hidden treasures on this 2.5 to 3-hour guided bike tour – a perfect way to explore the city! Start at Little Italy in Boston’s North End and pass sites like Copley Square, Fenway Park and the Faneuil Hall marketplace. Cruise through Beacon Hill and admire the diverse neighborhoods as your knowledgeable guide provides insightful commentary on Boston’s unique history. You may also choose to do this tour on an e-bike (select e-bike option at checkout). 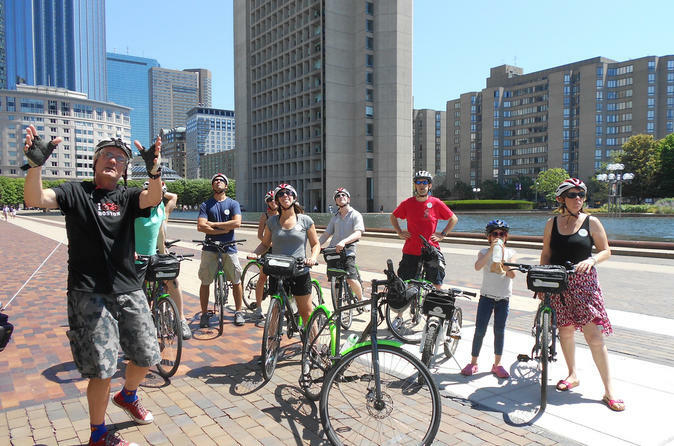 Enjoy a morning or afternoon bike ride through Boston and explore the city’s famous sites and hidden treasures on this 2.5 to 3-hour guided bike tour. After being fitted for a bicycle and helmet, follow your guide through Boston’s charming neighborhoods and pass interesting historical sites along the way. See the Bunker Hill monument and the famous USS Constitution. Also, bike along the Freedom Trail and explore Little Italy in Boston’s North End. Visit the Trinity Church in the famous Copley Square and Louisburg Square in Beacon Hill before heading to Fenway Park. Admire the scenic landscapes as you venture off the beaten path. Pass brownstones in Back Bay and the South End and ride along routes created by American landscape architect Frederick Law Olmsted. Discover the character and charm of each area you pass as your knowledgeable guide illustrates Boston’s interesting history. This bike tour is a great way to see the whole city -- and get some exercise too! You have the option of choosing to do this tour on one of our pedal assist electric bikes! At check-out, you'll have the option to choose the hybrid bike option or the e-bike upgrade option. This is a fantastic opportunity to try out the newest trend in cycling!